America’s favorite story about itself is that no matter how poor an immigrant might be when he or she lands on its shores, success is within reach if one works hard and takes advantages of the country’s abundant opportunities. While the Twin Ports have scores of Horatio Alger-style stories to tell, only a few those include names that have become part of the maps of both Superior and Duluth. One of them is Swedish immigrant Lars Lenroot. Lenroot couldn’t have come from a much more harsh beginning. His parents died in the poorhouse back in Sweden, and soon after, at age 22, he joined his brother Nils in Boston. There he spent from 1854 to 1856 finding his place in the New World. Like many immigrants, his name underwent changes. Born Lars Larsson, he changed it to Linderoth to distinguish himself from other Lars Larssons also apprenticing to become blacksmiths. In America, he simplified Linderoth to Lenroot. Unfortunately, the Lenroots arrived just in time to witness the first collapse of the region when the railroad dreams fell through—and just about everyone who wasn’t indigenous left. Duluth nearly emptied out (this was the Fish Eater era, when Orrin Rice couldn’t trade his Duluth property for a pair of boots), and loads of aspiring fortune hunters in Superior melted back into the forest to more settled parts of the upper Midwest. Instead of leaving—perhaps because they had foresight about a better future, or perhaps because they simply didn’t have the means to leave—the family remained, and Lars built himself a blacksmith shop on what is now Highway 53 (Second Street) in Superior near today’s Sixth Avenue East (across from where the whaleback Meteor rests today). The blacksmith shop served as a gathering point for all kinds of people on their way back and forth to new reservations and, in 1869, the dreamed-of gold strike up on Vermilion Lake. Lenroot gained a position as “Indian blacksmith,” and many of the region’s Anishinaabe brought their business to him. They also trusted him to give good advice on their increasing difficulties with the federal government—in the Ojibwe language. The shop also became a place where Swedish immigrants in particular could find friendly companionship in times of trouble. Lenroot’s homestead stood directly across the road from his shop. There, Lenroot became a leader in the fledgling Swedish community, starting the first Swedish Lutheran church in Superior (most civic leaders were Presbyterians and natural-born Americans of Anglo-Saxon extraction). A member of the Superior City board of trustees in 1862, his name appears on many early deeds untangling legal disputes in land ownership at the time. He served as Superior’s sheriff from 1871 to 1872, and he and his wife raised six children there, two of whom died of typhoid fever as young adults. Lenroot was well-known as a shrewd man, which is reflected in his involvement in whatever business seemed most needed—or most lucrative—at the time. After the Panic of 1857, when Superior and Duluth nearly became ghost towns, he bought up properties on both sides of the bay, invested in lumber camps, and built streets. He also was a trader and did his blacksmithing up and down the trail between Superior and what would become the Vermilion Iron Range, where he participated in a bit of mining speculation. He also ran one of the first ferryboat operations between Duluth and Superior. Both he and Frederica together had a reputation for being hard working, trustworthy, and pious. His wife in particular was respected for her sensible and giving nature. A family legend characterizes her: Once a brother of Lars arrived at the family homestead down and out, looking for lumbering work. Frederica spent all night sewing him a pair of blue jeans for the next day, losing the sight in one of her eyes as a result. In 1891, Superior honored Lenroot by renaming L Avenue (6th Avenue East) to Lars Lenroot Avenue. Today, the portion of Highway 2 between Hill Avenue and Highway 53 is known as the Lenroot Highway. 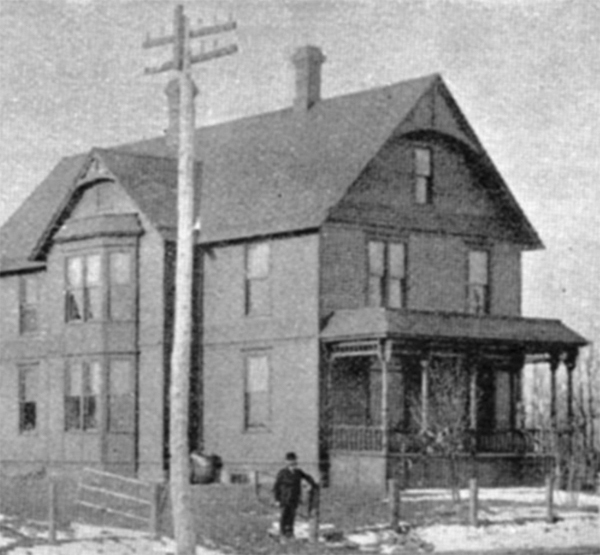 In Duluth, Lenroot owned property in the Riverside neighborhood, which was called Lenroot’s Addition when it first became part of Duluth. Today, Lenroot Street runs through that narrow portion of Riverside. When Lars Lenroot died in 1898 at age sixty-six, he was celebrated as a clearly recognizable force amongst that small group of Twin Ports pioneers who carved their communities out of the wilderness. As a Scandinavian immigrant, he was never quite in the center of local power, but his influence was felt and reflected upon in newspaper centennial retrospectives. He is buried in Superior’s Nemadji Cemetery. He did not live long enough to see the remarkable success of one of his sons, Irvine Luther Lenroot, who became a U.S. Senator from Wisconsin. Irvine quite narrowly missed becoming vice president and perhaps president of the United States. He was asked to run as Warren J. Harding’s vice president in 1920, but delayed too long in his decision to accept the role—some say his wife Clara was against the move—and was out-maneuvered by Calvin Coolidge supporters. Since Harding died in office in 1923, Coolidge became president, winning the office in his own right in 1924. So within a generation, the grandson of poorhouse Swedes came within a whisker’s breadth of the highest office in the land. A nephew, Arthur Alvin Lenroot Jr., also became involved in politics, and was elected to the Wisconsin State Senate in 1946, serving two terms. The Lenroot-Maetzold Funeral Home is a family product, and one of his great-grandsons, Jeff Nichols, is the owner of Heritage Cabinetry and Custom Furniture. Today Lars Lenroot’s descendants still live in Superior on the very property he settled on the corner of Lenroot Highway and Highway 53.